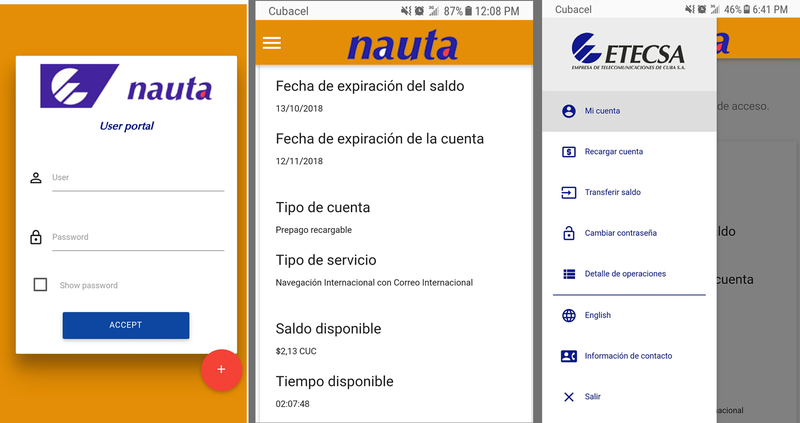 When somebody wants to confirm if they've received an international Nauta recharge or simply needs to know how many hours of internet connection they have left, they'll need to check their Nauta balance. There, the person will have access to information regarding its Nauta account such as its balance and remaining connection hours as well as the possibility to transfer the balance to another account or top its account up. Warning: The Portal's download speed directly depends on the reception in the area and whether the phone can connect to the Cuban 3G network. Before logging in a WiFi zone, or right after having logged out, there's a fairly simple way of knowing how much time there is left to connect to the internet without having to access the account. 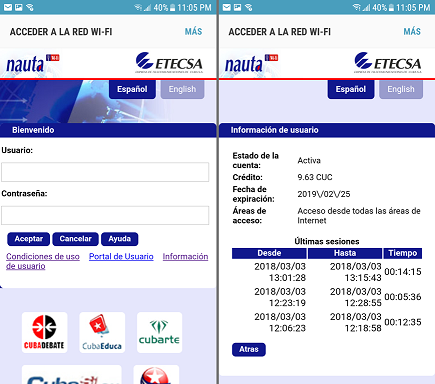 Without clicking on "accept" (because that'd cause to log in the website) access "User information"
To know exactly how much time of internet connection the person has left while Skyping, checking the apps on its phone or surfing the web, there's a really handy Cuban app called ETK. 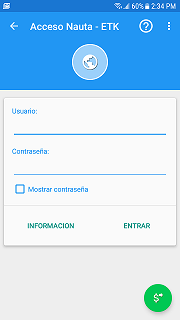 By doing this, when the person connects to the internet via this app ETK, the app will display a little time counter with the remaining connection time during the whole session.